Swedish Azz is a new group by Mats Gustafsson and Per Åke Holmlander, consisting of five European improvisers loving, respecting, and playing the swedish jazz masterpieces from the 50´s and 60´s. 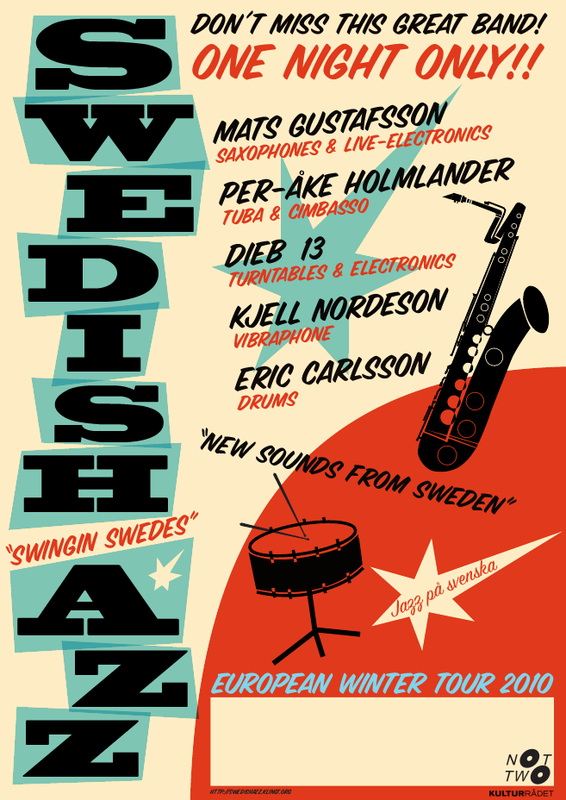 The Golden Age of Swedish Jazz happened in the mid 50´s, as we were told, and was represented by some very distinct and personal voices that were all taking their main inspiration from the American West Coast Jazz, but transforming it into a swedish colour and language, also including elements of traditional Swedish Folk Music. Lars Gullin, Jan Johansson, Bernt Rosengren, Georg Riedel, Lars Werner, Berndt Egerbladh and later Per Henrik Wallin were all part of this movement and we just LOVE this music! Swedish Azz wants to explore the possibities to use these wonderful and strongly lyrical melodies and put them in a contemporary structure and soundscape. We want to find out, or at least to try out, what will happen when you put these melodic lines in connection with a.o. live electronics and experimentation in form, using the freedom of improvising freely.